The world around us is structured: some of its features are more fundamental than others, some phenomena depend on others, and some things exist because others do. Perhaps, there is a layer of reality at which we have reached rock-bottom, a layer such that nothing is more fundamental than the items belonging to it. It is a prime task of philosophy to make such pronouncements of relative and absolute fundamentality, a task whose centrality has been acknowledged by an increasing number of philosophers in recent years. Surprisingly, structurally the same debate is led in very diverse subareas of theoretical philosophy, most prominently in metaphysics, epistemology, and the philosophy of language. 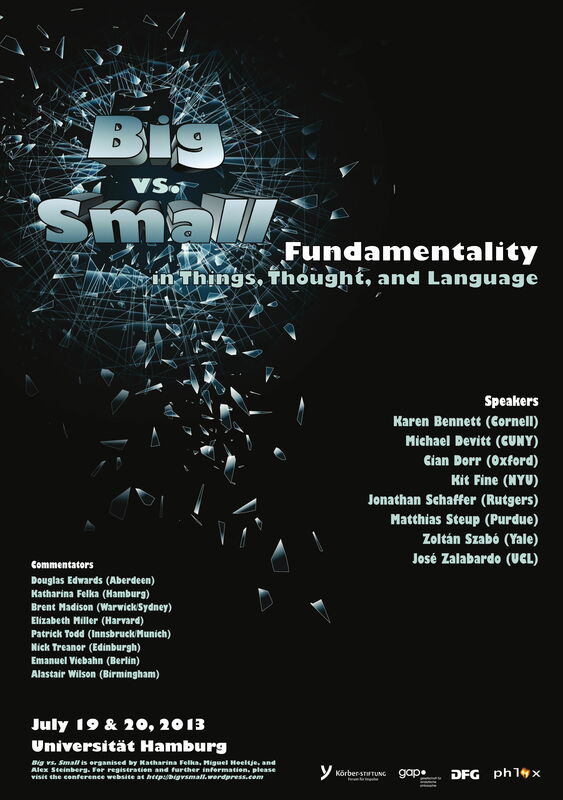 The workshop Big vs. Small will investigate the concept of fundamentality as it figures in central questions within three areas of theoretical philosophy: metaphysics (what is more fundamental, wholes or their parts? ), epistemology (what is more fundamental, beliefs or belief systems? ), and the philosophy of language (what is more fundamental, words or sentences (or whole languages)?). A first goal of the workshop is to discuss these issues by bringing together leading figures of the opposing sides in the relevant fields. It is striking how aspects of the discussion concerning metaphysical dependence, epistemic justification, and semantic priority interact and mirror each other. A few examples should suffice to make the point. Justification/Dependence: the argument against justificatory infinitism has a direct duplicate in the claim that alleged dependence chains cannot be infinite lest anything in the chain remains ungrounded. Dependence/Semantic Priority: a general view on the ontological priority of parts or wholes will have consequences for the question of the relative fundamentality of simple or complex expressions. Justification/Semantic Priority: the epistemological question about justification holism has explicitly been considered to bear on the issue of semantic holism. The debates are thus not only interesting in their own right, but intimately related to each other. A second goal of the workshop is to investigate these connections and re-evaluate each issue in light of the others. 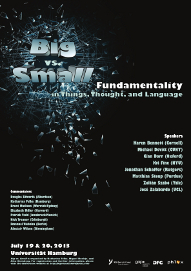 Fundamentality questions far outrun the three areas of theoretical philosophy that this workshop focuses on. They occur, e.g., in the philosophy of mind, the philosophy of science, in aesthetics (e.g. what is more fundamental, an object’s being beautiful or our experiencing it as such?) and practical philosophy (e.g. what is more fundamental, general moral principles or particular moral judgements?). In short: issues of fundamentality play a central role in many (arguably: all) areas of philosophy. This makes it essential to get a clear idea of what fundamentality is. In the last few years significant research has been done on general features of the fundamentality relation, especially its connection with (metaphysical) grounding. However, its results have not yet been systematically applied to, and tested on, the philosophically substantial debates in which the notion plays a central role. A third overarching goal of the workshop is to fill this lacuna and to discuss and clarify the pertinent notion of fundamentality in this light.